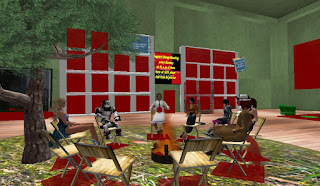 Every Sunday at Noon SL time, a depression support group meets inworld to help visitors with any problems. Titled “Survivors of Suicide,” the group in fact takes care of a variety of mental health issues depending on the needs of those at the group. Dropping over one Sunday, the group's building had a few games around, in addition to a campire area where all were gathered. Fidelius "Fid" Dollinger was the group member leading the chat that day. There were a few others there, at least one other whom had also just found the group. Fidelius had this to say about the meeting, "a short explain of this group here, we are here for talking out what bothers us or also to share nice moments. All what you want to talk (about), you may. You aren´t forced to say something. The important (thing) is that nobody needs to have the feeling ' I am alone.' That is why we are here." Of the subject of depression, "We are a handful of staff here, and we try always our best to help. And we, the staff, know also very well what is going on by depressive moods, because we are dealing with it too, or have dealt with it a long time." Fidelius admitted that he had a history of depression since he was a teenager, "but I have started a journey for myself and it still continues, and I work all out my feelings and fears … since then I feel much better." Others there had comments and questions, "What happens when you aren't strong enough? When you are sick of fighting every day?" "This is why there are places like this, so you can meet people that can help you along." "I have to fight evey day in real life, a fight where I never will win. BUT, shall I let this stop me from letting me feel good? No." "Some days you just want to curl up in a little ball and never wake up. Somedays you say 'why am I even here,' yet somehow I still am here, but I grow weary of the fight ..."
People discussed how to best deal with problems, "Very important to let the past in the past …" "That's easy to say, but not so easy to do." "Well, SL can be helpful to find a way out of the blues." "Learn lessons and try not to repeat the same mistakes." "I'm sick of people telling me to simply forgive and let go when you don't know what's in my head …" "I know to find the right moment … isn't often. … you have to catch the right time." "I'm guessing when people say 'just get over it,' it makes you feel as if there almost dismissing how you feel?" Fidelius offered suggestions time to time, including a reference to a kids' cartoon from years ago, "Do you know of 'Puff the Magic Dragon?' He is my absolute favorite, and I think we all have a 'Puff' inside us. … He is a dragon, a cation from I think the '70s. He was shown a small boy, Jacky Paper, who hadn't a self-assurance, that he was thinking he too hadn't self-assurance deep inside him. … He showed the boy that he had a self-assurance deep inside." Later I met Krissy Sinclair, the founder of the group. She called Fidelius, "my angle for running the support groups." She was happy to see me, "I get so excited when new people find us." Besides the support meetings, "We also post daily healthy living articles to the group, and host a candlelight memorial in a skybox above us." Krissy explained in real life, she has a Masters Degree in social work, "that is what made me start this project in Second Life. … Three years ago, we have been around a long time by SL terms." I asked her if there was a particular event that sparked its founding. 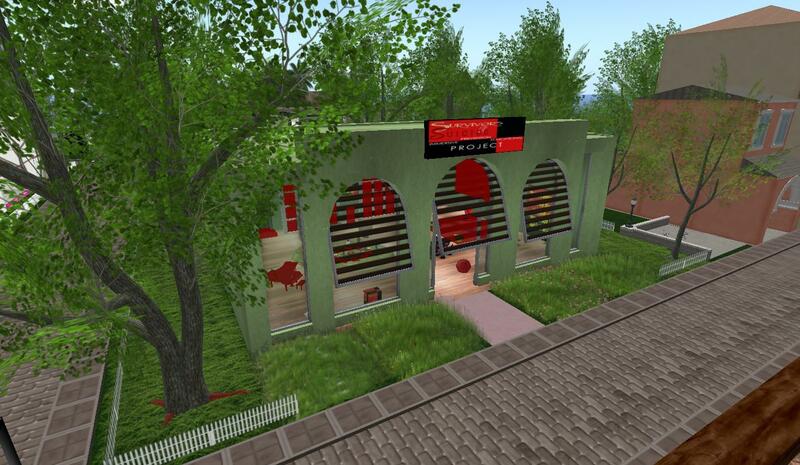 She answered, "I am an artist in real life, and I brought my art into SL. Then I sis an exhibit called 'Life/Death.' I found people were drawn to the Life portion of the exhibit and they liked to hang out there. People told me their story and many had depression. I also used to run a depression support group in real life. So those combined made me think of doing it here." "At first, my friends said 'don't do it.' I did it anyway, and we are now almost 300 members strong. … I was thinking if I got 25 members, that would be good (laughter). … It is very rewarding, and the grow helps me as much as I help them. The group members all learn to help each other. We use the chat feature as 24/7 support as well." "We do not charge any fees. We also don't do counseling as I feel that needs to be done in real life. We offer support. … I often get thank you notes from people who say this group has helped them." Before parting ways, I took a look at Fidelius' profile. Among the information were a few words of wisdom. "Learn from the past, live in the present, and have trust in the future." *note* the red areas in the pictures are from my viewer, which was getting buggy at the time. great article Bix, i'm a proud sponsor of the SOS group since 2009 for providing tier since Krissy Sinclair started it, proud of how far they have gotten and hope their message is heard everywhere in SL such as this article. 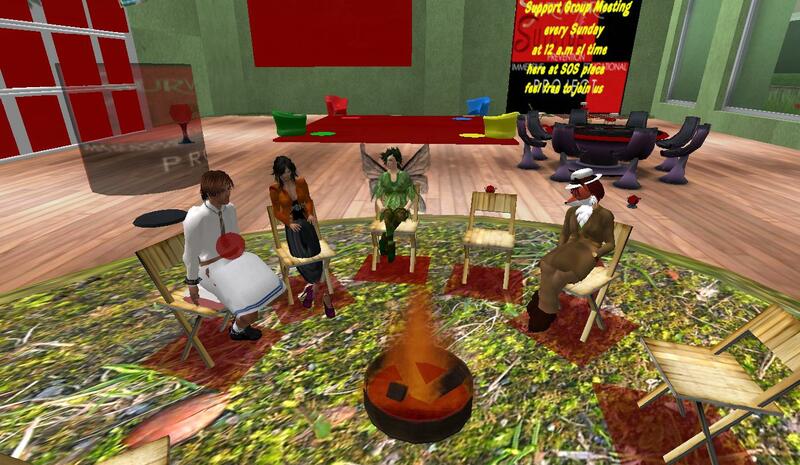 I'm glad to see that there are support groups like this on SL. Many people who are isolated or unable to reveal their pain in RL could benefit from support in SL.